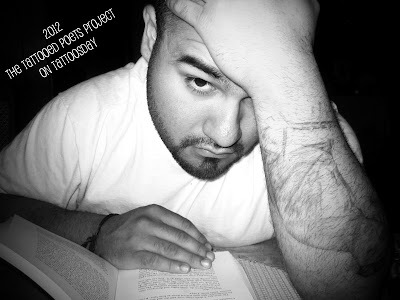 Our second tattooed poet of the day is Michael Torres. "...is a poem called Oh Yes by Charles Bukowski. I got it done at Por Vida Tattoo in Upland, California. I got it done because at that time in my life poetry was becoming more of a hobby to me and I was beginning to see my world changing in front of me. Friends that got married and had kids right after high school were finding out that things weren't going exactly as they had planned. The poem represents the realization that there is much I have to do in life before I worry about settling down simply because I think I have to." "The second tattoo in the same arm is of the poetry muse, Erato. I basically liked the image I googled. 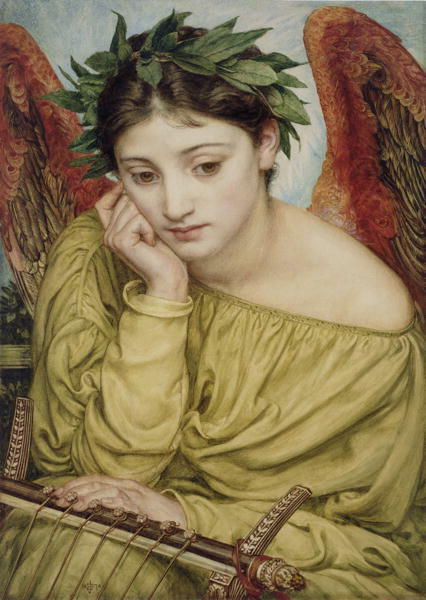 The original artist is Sir Edward John Poynter and it was done in 1870. I had the tattoo done in Montclair, Ca at Skills for Thrills tattoo shop. Me being a poet wanted to have the muse with me all the time. Even though we believe we should be lucky to have her whisper those golden lines into our ears I thought, why not have her around all the time. I am not going to stop writing any time soon and I don't take for granted all I have been given because of writing so this was for her, the muse. 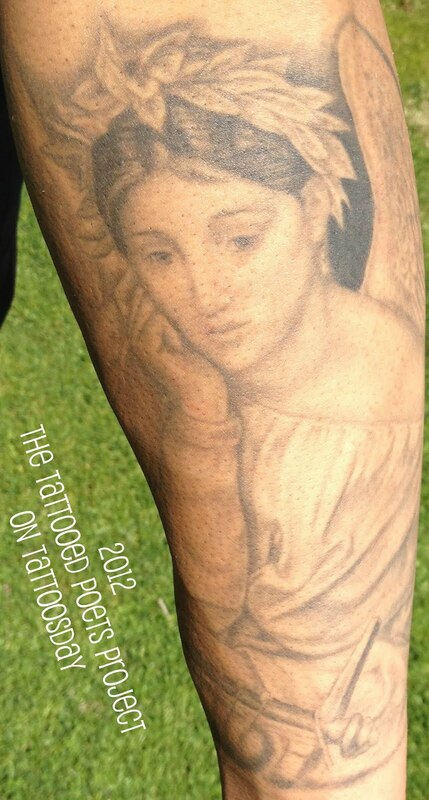 Both tattoos were done on my lower left arm." and pens click December raindrops. me, running towards the lake. Michael Torres was born and raised in Pomona, California. He was exposed to poetry at an early age, learning the works of William Shakespeare, Langston Hughes and Emily Dickinson to name a few. He has been published in Beatlick News, The Chiron Review, Left Coast Review, and Solo Press. His first chapbook of poetry, The Beautiful Distraction was published by Finishing Line Press. Michael is currently in school pursuing a degree in creative writing at the University of California, Riverside. He lives in Pomona, Ca. Thanks to Michael for sharing his poetry and tattoos with us here on the Tattooed Poets Project!